I majored in English literature in college. I read hundreds and perhaps thousands of pages every week, ranging from Beowulf all the way through 21st century literature. I read authors like Hemingway, Beckett, Chaucer, and Austen. So I would be a natural choice to read poetry, right? It doesn't occur to me to pick up a poetry book the same way I make lists of novels to devour. 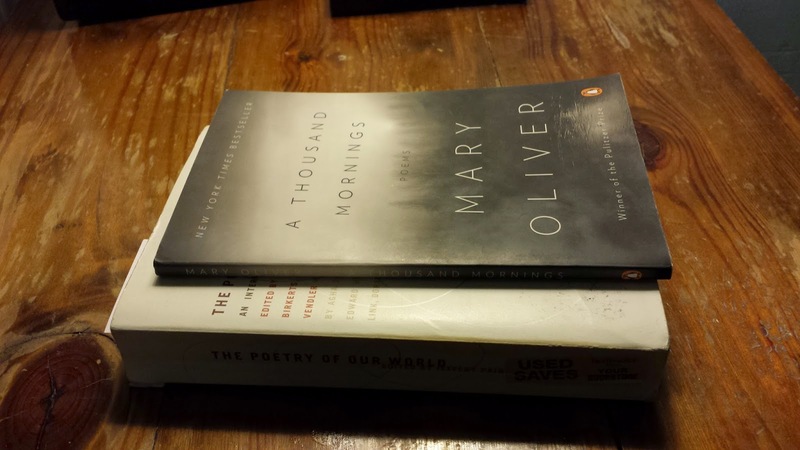 But as I started to think about my reading habits in 2015, I decided to work poetry into my book rotation. I'm trying to keep it simple and low-stress, committing to read just one poem a day. I don't want to be the reader who is intimidated by poetry anymore. I don't want to automatically assume that I won't get it, that there isn't the same kind of payoff from reading a book of poetry that I would get from reading a novel or biography. 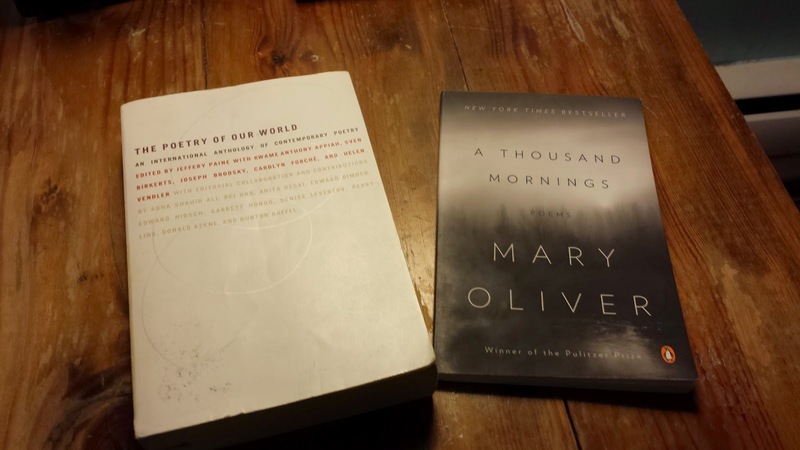 So far, I've completed A Thousand Mornings, a book of poetry by Mary Oliver. I am now reading through The Poetry Of Our World, a collection of poems from 20th century poets across the world. I must confess that I had an easy entry into this book. The first poets were Robert Lowell and Elizabeth Bishop, both of whom I studied in a college class. Now I'm wading into new territory, with poets like Octavio Paz from Mexico and Anna Akhmatova of Russia. I'm learning to read in new ways. I'm getting out of my comfort zone and discovering new writers who spin magic with their words. Do you read poetry? Do you find it intimidating? Who are your favorite poets? I like the idea of poetry more than poetry itself, I think. It's hard for me to get into poetry because I want to read straight through a book of poems instead of experiencing each poem by itself. I think your idea to read just one poem a day could really work though - maybe I'll try it sometime. My favorite poetry is by Pablo Neruda. I write some poetry so am more open to reading poetry, especially new writers. I like the anthology by Garrison Keillor's titled Good Poems. By the way, I have a poetry blog that I occasionally add to - Strummed Words at http://strummedwords.blogspot.com, under the name Gerry. I love reading poetry; enjoy writing some of my own too. It's obviously not going to be for everyone so don't feel obligated if you don't get much enjoyment from it. In my experience, find poetry that you can connect with in some way and it won't seem like sitting in a college English class again. I'm particularly fond of many of the romantic poets but some others include Derek Walcott, E.E. Cummings, T.S. Eliot and Edna St. Vincent Millay. I think for me it's not so much that I feel obligated but that I want it not to intimidate me anymore. Derek Walcott is new to me, so I will definitely check him out. Thanks! I find poetry intimidating, but I know it shouldn't be that way! I just haven't taken the time to find poetry that is modern and accessible. I really want to read Margaret Atwood's poetry, though! I've loved the few poems of hers that I have read. My problem is that I enjoy the idea of poetry and select poems, but I don't like to sit down and read a whole book of poems straight through. Instead I like to be presented occasional samples of it to savor and think about. Congrats to you for venturing out of your comfort zone and embracing poetry. My favorite poets are Robert Frost and Emily Dickinson. It's hard to break ourselves of that idea of reading and reading until a book is done. I think reading poetry and short stories really change the way that we approach reading. Poetry is one of those things I want to read more of, but for some reason never do. I do have some favorite poets: Rilke, Teasdale, Wm. Stafford, Frost, T. Hughes, etc. I really should read more poetry, but I like to savor poems one at a time...a book of them all at once feels like overload.Happy Poetry-Reading! That makes sense. I feel like someone should set up an email blast where you get a poem in your inbox every few days to read and savor! Loved your post, Lindsey! I have seen reactions similar to yours from other friends who studied literature in college, including my own sister who majored in literature. I love poetry, though I don't read it as often as I like. Mary Oliver is one of my alltime favourite poets. So glad to know that you read and enjoyed her book. I would also recommend her recent poetry collection 'Blue Horses' - it is so beautiful. It is difficult for me to say who is my favourite poet, as there are so many - but if I try making a list, Mary Oliver, Rumi, Pablo Neruda would be there. If it is okay, I would love to make a few recommendations :) Some of my favourite poetry collections are '101 Great American Poems' (has some of my most favourite poems), 'Odes to Common Things' by Pablo Neruda' (Neruda takes everyday things like a tomato, an onion, a pair of scissors, a cat, a dog and creates beautiful poetry out of them), 'The Essential Rumi' by Coleman Barks, 'The Golden Gate' by Vikram Seth (a novel in verse - so beautiful). The Garrison Keillor collection that Harvee Lau has mentioned is also very nice. Garrison Keillor also edited another collection called 'Good Poems for Hard Times' which is also nice. Your post made my day, thank you :) Happy reading! What a great list to work from! Thanks so much! My bookclub is doing a survey of poetry. I have a post up today about Blake's poetry! I've also been reading Wordsworth, and I'll be moving on to Coleridge and Keats. The Mary Oliver book looks good. I can't imagine translating poetry from Russian or any other language. It loses so much in the translation. I imagine it would lose something in translation. But I guess until I learn Russian, it's the best I can do! Poetry is not for everyone, but there is at least one poem out there for everyone to enjoy or love. I highly recommend Sonnet 17 by Pablo Neruda - it's a classic love sonnet, and most people love it! It's my favorite. Yes, Neruda is a great one!